This review is going to be slightly different. 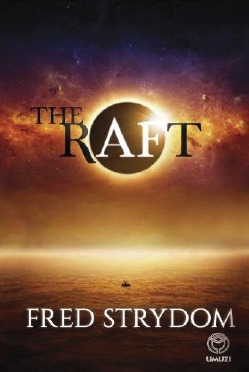 I teamed up with Katherine Kirk of Literogo to read The Raft, and then write a joint book review. Our discussion about the book got quite lengthy, so we decided to split it up between our blogs so that we can give you all our thoughts without giving a headache too. Katherine is hosting the technical part of the review (which you can jump to here), while I have the more general discussion in this post. On Day Zero, the collapse of civilization was as instantaneous as it was inevitable. A mysterious and oppressive movement rose to power in the aftermath, forcing people into isolated communes run like regimes. Kayle Jenner finds himself trapped on a remote beach, and all that remains of his life before is the vague and haunting vision of his son. . .
How did you feel about the existential/surreal elements of the book? Was it too philosophical? How did that affect the pace? Laurel: I adored reading the whole book. Not too philosophical, and no change in pace for me. The existential/surreal elements are part of the fabric, and I think necessary. I really appreciated the existential questions it played with, such as if our memories are wiped, is there meaning to our existence – and what is is like? Memories give our lives some meaning, but there needs to be more than memories. We need a purpose, otherwise we will despair. Kath: This was my favorite aspect of the book. It brings up the question of nature versus nurture. On the one hand, if you lost all your memories of events that shaped who you are, do you lose your identity? If a serial killer has no memory of ever having killed, are they guilty? On the other hand, it brings up the questions of fate and free will, or (as you explore below) the guiding hand of a benevolent (or malevolent) powerful being. There’s a girl whose entire life has been planned for her before she was born, complete with biological triggers that she has no control over. But you also have the Dark and Light forces that manipulate all the characters and lead Kayle through his journey. I’ll play with this idea more later. Laurel: Well, arguably, the identities of many of the characters were imposed on them by their memories, so it would seem that one loses one’s identity if one’s memories are lost, for sure. Could one say, really, that anyone in this book exercises free will? (In an aside, I wrote this in response to Kath’s observation above before I read any of her later comments on free will. Perhaps we’ve both been on the same page all along?) Oh, and I’ve just made myself chuckle, considering my take on the subversive elements in the story. …the faint shimmer of a heat mirage weaved like a chorus of ghosts. What themes does The Raft explore? At first I thought that having a whole load of people sit back on their arses waiting for one person to save them from their mishaps being dumb and quite anti-Darwinistic was a load of rubbish. I’d just been reading a book about taking responsibility for one’s own actions and learning from them. Then I realised I’d misunderstood the observation. To sit back and let someone else do all the hard work is very different to “survival of the fittest”. A very astute observation. While musing on this quote, being a Christian I realised people could assume that’s how Christianity works: Man (male and female, the species, homo sapiens) sitting doing nothing, and Jesus dies to save us. Well, in a way, that’s true… but also very not true. True that there is nothing we can do to EARN salvation, but not true in that we have a responsibility to change, to endeavour and strive to become more like Christ every day. Kath: I’m not a Christian, so I didn’t quite get that from it, but it’s interesting to see it from your perspective. To me, it seemed like it might have been criticising the complacency and apathy of current generations, where we whinge about how bad things are and wait for someone else to fix it. Facebook slacktivism, where changing a profile picture is supposed to make a difference (it does nothing)… I thought it was a valid criticism. Laurel: I didn’t think of that, but I agree with you. Entitlement did briefly come to mind, but the thought didn’t formulate properly. The ocean foamed, folding over itself and charging the shore, passing our knees at it came up and sucking hard on us as it went back out. So, my thoughts about the Superman quote led me to further wonder whether The Raft is arguing the case for Creation/Creator or evolution, in that life is meaningless without purpose, even if one has memories – and it is only with a creator that our lives gain a purpose. With evolution there is no purpose. No rules. No structure. Whereas with a creator, there are rules and structure. And purpose. Meaning. Kath: I think you could interpret it a little differently. This is where what I was thinking about fate and free will. I felt like the book valued every life in it, so in that sense life cannot be meaningless: each character had a universe of experiences and motivations behind them, and having their memories mixed up did something crazy to that (I loved it!). I felt really uncomfortable with how a single person could manipulate the lives of so many people, both with good intentions and bad. You’ve got the dark forces manipulating people and causing the memories to be stolen, and then you’ve got the light forces manipulating people in order to guide Kayle along his otherwise too coincidental journey. So, they’re both playing God: the malevolent destructor who is trying to get to the next level of existence (which you could call Darwinian as it would be survival of the fittest and evolution of the species) but you’ve got the benevolent God as well, using the same manipulation of people to try to restore things to the previous order, so that humanity can evolve at its original pace. Laurel: Hmmm. I didn’t even think of free will while reading the book. Very good observation. And as I’m totally an advocate of free will, I see what you’re saying as it was rendered in the book. Kath: As for rules and structure: I felt that (according to the novel) those are social constructs, and the lack of critical engagement with the rules is what makes the Beach and the Renascence so darn creepy. Having laws set down that are unquestioned and violently enforced turns out to be evil, however nicely they’re worded. Ultimately, this seems to be a novel about the freedom to make moral choices, and to do your best, according to the best of your abilities and knowledge. People in the books have their ability to choose taken away in several ways: they lose their memories, so they can’t just choose whatever they chose before (no more “It’s always been this way” excuse). They have the rules of the Renascence, which are unquestioningly adhered to, or they face physical torture. They have their memories (and therefore their identities) manipulated, so the knowledge they have is altered, which might change a choice they would have made otherwise. They have choices made for them by their families, which are permanent and unchangeable. So, initially there is chaos because the rules and structure of society fall away when the individual identities cease to exist (no one has opinions any more if they can’t base them on previous positive and negative experiences), but I don’t think the book is trying to make a case for either of them. I think Strydom has given us a thought experiment: what happens when the past, and the personal experiences of everyone on earth, ceases to exist? Laurel: Hmmm. I found the people on the Beach to be pretty subversive. Gideon’s discussion about dreams and that they won’t talk about them because they aren’t allowed to, even though they know they’re all having them; Kayle throwing the “tea leaves” away in the morning breeze; the rafts as punishment for any sort of rebellion. It’s clear that the people living on the beach are discontent with the Renascence and the philosophies that are being imposed on them. And them collecting things, treasures in their tents. Kath: You know, I didn’t put that together until you mentioned it – the collected items. I thought they were odd but I didn’t hold that up against the ideology they were being forced into. I thought it was interesting how docile people became once they’d lost their sense of self and identity, by losing the memories that shaped them into who they were. I thought it was an excellent critique on the problems that arise when people blindly follow leaders. Although in this case, many of them didn’t seem to have a choice. The beach felt very surreal to me. Laurel: Well, part of the ideology was that they weren’t to hold onto anything material, which is why I picked up on that, because collecting anything, placing value in any thing, is against the whole concept of becoming one in thought. Funny how we interpreted the beach differently. Yes, after people had been on the rafts perhaps they were more blindly submissive, but before they went on rafts? I’m pretty sure Kayle wasn’t the only one who didn’t do as told. The only thing left to be in this world is a martyr. One day we’ll look back and be forced to ask ourselves what good we’ve ever been to anyone. I categorise this book as social science fiction (something that amuses me immensely) as I felt it explores lives lived with no purpose as they attempt to search for some meaning to their existence. Kath: I think it was interesting that we took this to be slightly different. For you, the importance was having purpose in life. For me, the importance was having the freedom to choose. Both deal with intent; they’re connected concepts. This is why I love being able to talk to friends about books! You always see new things that you never would have seen before. Laurel: And it fascinates me that while free will is something I totally back, I didn’t pick up on it at all. I can see it now, but I didn’t while I was reading the book. Did you figure out the ending before it happened? Or were you surprised? Laurel: I didn’t figure out the ending, so was surprised by it. And a bit disappointed too. It was, however, very poignant and gave more food for thought when done reading. Kath: I thought I had it figured out, but I was completely wrong. He really fooled me! Sneaky Fred Strydom. Remember, Kayle. Victory isn’t getting what we want. It’s getting what’s owed to us. And what’s owed is balance. Balance between right and wrong, the guilty and the innocent, the saved and the damned. We might not ever have the Utopia we’ve dreamed about–I’m not even sure it’s what we really want–but balance: it’s the first step towards retrieving Man’s stolen destiny. Towards peace. Did you feel that the son’s perspective was missing in the book? Would it have been better to give him some more characterisation? Laurel: No. That didn’t worry me at all. This was definitely all about Kayle and, well, while it may have been nice to know what the son had been doing, that wasn’t part of the story, and that was ok with me. Kath: I felt like the son did lack a bit of personality or depth. I think perhaps having a snapshot of the son’s memory of his father, how he perceived him or how that memory changed according to the events before Zero Day would have been a valuable addition to the book. I knew how everyone in the book thought except for the son, and it made him a less tangible character. If Fred Strydom were to write another book, will you pick it up without hesitation? Kath: Absolutely. I loved his style and I’m interested to see what he would do with different subject matter. He clearly considered so many different aspects of the book while writing it; I think it can only get better and he’s definitely an author to watch. Laurel: I would definitely keep an eye out for more books from Fred. He has a good handle on how to write without getting bogged down in local politics – something I struggle to deal with from many other South African authors – and he clearly has a fantastic imagination. And a complex mind. I admire both those qualities, and diamonds like this book are few and far between. To get the “technobabble” part of our conversation, our views on the structure of the book, characters and other nitty gritty details, do head over to Literogo. Fred Strydom studied Film and Media at the University of Cape Town. He has taught English in South Korea and has published a number of short stories. He currently works as a television writer and producer in Johannesburg, where he lives with his wife, three dogs, cat and horse.